We are delighted to be able to present the brand new range of cast iron stoves made by Invicta in France. Introduced into the UK market in June 2008 these models represent a top quality and beautifully made collection of wood burning appliances featuring traditional and modern styles and some interesting quirky designs. 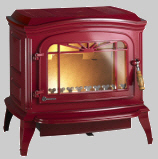 Please click on any of the pictures for further details on any of the stoves.